In 1961 the Grand Lodge of India, which is an off -shoot of the Grand Lodges of Scotland, England and Ireland was constituted. The Grand Master of the Grand Lodge of India Mr.Arun Chintopanth was recently here in Kochi to preside over the meeting of the Regional Grand Lodge of Southern India. 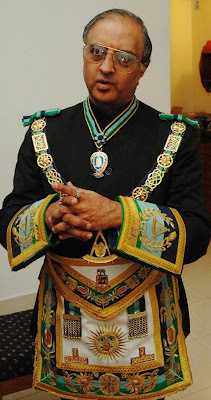 In an exclusive interview with the Grand Master sought to demystify the Masonic Lodge. Arun Chintopanth in full regalia. Dont miss the apron. It is not a service organisation. It is not a religious group. It is not a mutual benefit society but it is a combination of all these. It is not religious but spiritual. Before the start of any of our meetings we open the five Holy books, Bhagavad Gita, Koran, Bible, Guru Granth Sahib and Zend- Avesta and place it on a special altar. We pay obeisance to them and only after that do we proceed with our meetings. How many lodges and members are there in India? There are 343 Lodges and 17,000 members. Please name a few eminent Indians who were past and present Masons? Do you all do charity work? Yes. Though we are not a service organisation, charity is an important component of Free Masonry. We contribute from our pockets and we don't do it for publicity. We do it quietly to satisfy our inner conscience. We run the Masonic Paediatric Hospital at Coimbatore, Masonic Public School at Delhi and we have collected Rs 1.5 crores for the Tsunami fund. We get requests for assistance all the time. He should be known to two other members. If he satisfies the qualifications, there is a secret ballot and then he is initiated into the Lodge. Can an atheist become a Free Mason? No. He has to be a believer, irrespective of any religion. If you are not a secret society why do you have your meetings behind closed doors? We are not a secret society. Masonic directory has our names and addresses printed on it. Everyone knows our meeting places. But we have certain secret rituals and secret modes of recognising each other. The rituals are secret because we want it to be an exclusive mystical and spiritual experience for our members. To maintain the spiritual sanctity we have it behind closed doors. What is the punishment if the secrets are revealed? The punishment is only symbolic. Does the ritual have any similarity to subterranean rituals? The rituals are based on the construction of King Solomon's Temple. The artifacts, the tools are used as symbols. A subterranean passage is mentioned but it is a misconception that there is a similarity. Does Free Masonry have any association with other secret organisations like Knights Templar, Order de Sion, Illuminati? We do not have any connection with them. It is all popular fiction. What is the symbolic association of the sun? Does the Grand Master represent the sun? It illuminates. The motto is "Let there be light." It is symbolic because the Grand Master is the highest in the hierarchy, so he illuminates. This has nothing to do with Illuminati. The ancient religions of the Druids worshipped the Sun. Is this a remnant of that religion? No it is not. It is only symbolic. Not only the Druids many other ancient religions worshipped the Sun too. We are not a cult. It is not a religious organisation because we are not dogmatic. We teach through our rituals and symbols. Why are you demystifying now? There is a lot of misconception about Free Masonry. It is a noble concept of Fatherhood of one God and Brotherhood of all men. First Published by The Hindu in 2005 August. I read about this interesting read. But I had few questions about free masonry. Will be able to answer it? Or can you direct me to someone. As a student on comparitive studies on various relegions, I really value to learn about Free Masonary. Could any body direct me to the active members in this Organisation? I am from Thrissur, and I found a Free Masons Loadge in the Town also heared that it is more than 100 years this Loadge functions. Would like to experiance the rituals and feel the spitituality. Is there a lodge in kochi?